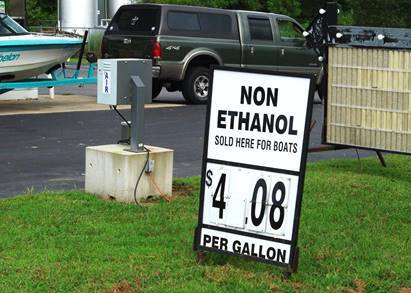 According to those surveyed by BoatUS, 91 percent prefer non-ethanol fuel for their boats. Big Ethanol” is at it again. In a new advertising campaign timed with the start of boating season, the Renewable Fuels Association (RFA), the leading trade association for America’s ethanol industry, continues to spread mistruths in its support of the Renewable Fuel Standard (RFS), a 2005 law that mandates the blending of biofuels such as corn-ethanol into our gasoline. The nation’s largest recreational boating advocacy, services and safety group Boat Owners Association of The United States (BoatUS) clarifies the ad campaign’s spin with hard truths. SPIN: E10 is the “preferred choice by professionals” with supporting quotes by the National Boat Racing Association and Crappie Masters. HARD TRUTH: Both organizations are sponsored by the RFA. HARD TRUTH: This impractical and potentially very unsafe “tip” asks boaters with built-in fuel tanks to do the impossible. Removing and disposing of phase-separated fuel – a result of too much water in moisture-attracting ethanol fuels – can only be done safely by professionals and is expensive. Even for those with portable fuel tanks, this RFA spin offers no practical, reality-based solution to the challenging disposal issue of the ethanol-and-water soaked gas. Go to BoatUS.com/gov/rfs.asp for more information on the Renewable Fuel Standard. BoatUS is a member of the Smarter Fuel Future coalition.